Place chicken breasts on prepared baking sheet. Cook in the preheated oven until no longer pink in the middle and juices run clear, 15 to 25 minutes. An instant-read thermometer inserted into the center should read at least 165 degrees F (74 degrees C). Shred chicken breasts. 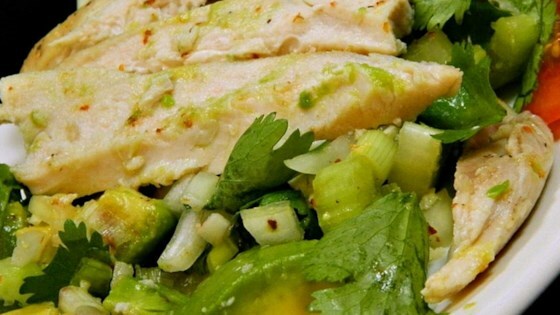 Stir chicken, avocado, scallions, celery, onion, lime juice, cilantro, cayenne pepper, salt, and black pepper together in a bowl. Yum, yum, yum! I used canned chicken and two small avocados until I thought the balance was right. Delicious!! I wanted a healthy chicken salad to put on a sandwich without all the mayo and sour cream. This one has great flavor and the onions really add great flavor!